Yesterday was Valentine’s day and other than painting a few watercolors in pinks and reds and purples with the kids, it was the same as any ol’ restful Sunday. I am not sure why we didn’t make a big fuss about the holiday this year. Regardless, it was nice not to feel like we had to be anywhere or do anything out of the ordinary. We went to morning church and then to brunch, afterward heading home for movies and naps, our winter Sunday rhythm to a T.
Later that day as I was bouncing a teething Alfie (who is getting three new teeth all at once, poor fellow) I felt like grabbing my phone to reach out to a friend to let her know she was on my heart. Do you ever feel this way? Something pulling at you, tugging…tugging…tugging, something within calling you to act. So you do, but aren’t quite sure as to why? I like to think it is God’s doing. Him putting people in our lives when we need them most, or perhaps when they need us, and shining light onto areas of our heart that could use some watering and pruning. So this dear friend and I, we chatted back and forth and later that day she paid me a surprise visit! With a Valentine gift, no less. Such a thoughtful giver this friend is, so intentional in what she brings by. She wrote out a little verse on a paper heart with some gardening gloves for the spring season. What a gift. What a beautiful message. Her little one went off with Theodore and Stella and played in the loft while I changed Alfie on the floor and we talked about life and motherhood and postpartum hormones. We brought up ideas of where to take the kids this spring and what we were going to plant in our gardens. It was a short visit, maybe twenty minutes, but afterward my soul felt so alive. So full. My heart glad for this person and for the gift of friendship we have given each other. Later that evening I sat down to look over some new gardening techniques to keep our tomatoes from topping over as Andrew and the kids hug out in the living room. I looked at when we could start our seedlings for vegetables we have not yet tried and how to make a simple wildflower garden. 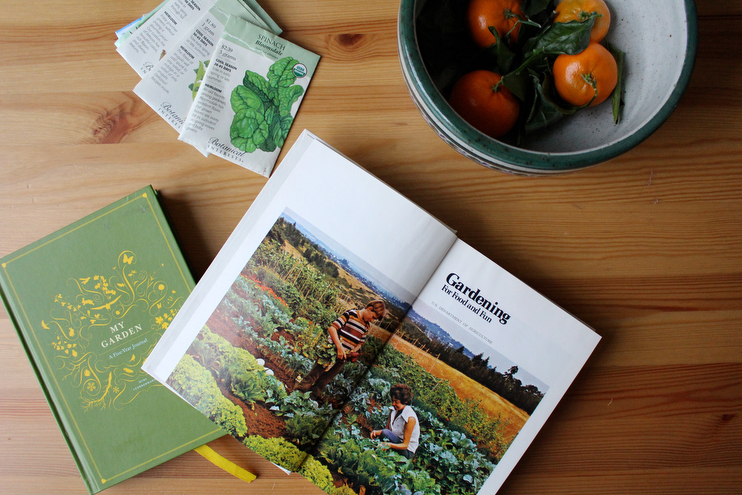 I flipped through last year’s growing journal to see what we had planted, to underline what went well, and what did not. I found it rather funny to read that I did the same thing two years in a row, and one year get a great tomato crop and the next, got close to nothing. But the weather, the rains, the sunshine, that’s always changing…the world constantly moving with us trying to catch up…or to learn that while we think we’ve got it all figured out, we don’t. Oh, the lessons nature teaches us. After I bookmarked a few pages and jotted a few new notes in the margins of my old, tattered reference guide from the seventies, I gathered my gardening goodies together and placed them in the straw basket on our countertops near the pantry, with hopes to revisit them very soon. As I turned around to face our wall of windowpanes, I was greeted by a fresh, newly emerged tulip! A soft, muted pink that had slowly grown from stem to flower in just a few short days since I had brought it home on Friday. 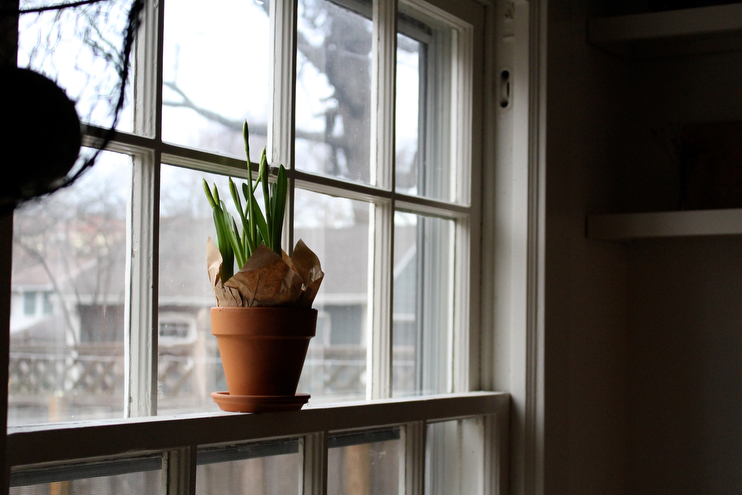 I called Stella in to show her the flower, teaching her that a little water goes a long, long way, and then we went over to check the daffodils sitting in the window sill to see if they too had grown. No flower yet, but the plant had grown nearly two inches since we had watered it last and will probably flower later on today. These little beauties had been working hard in here.